Four Points by Sheraton with public facilities including lounge, roof top bar, restaurant, meeting facility, exercise room, lobby, and reception area. Restaurant area / 2,194 sf. 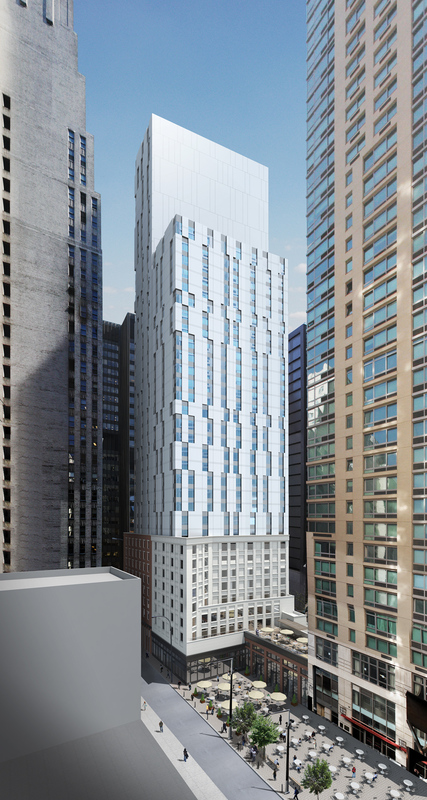 Conveniently located next to South Seaport and the Fulton Street retail area, the total building area of 122,768 sf will function as a select service hotel in the Financial District. The simple shaped tower will be designed to allow maximum sunlight. Staggered vertical windows will texture it carefully. The urban plaza is an extension of the existing urban plaza, providing urban green in the Financial District.